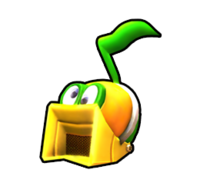 The Off-Key Speaker is an item in Mario Kart Arcade GP, Mario Kart Arcade GP 2, and Mario Kart Arcade GP DX. The Off-Key Speaker is a lock-on item. Upon hitting a racer, the Off-Key Speaker will cause them to lose speed and then proceed to hover around the racer while blasting obnoxious music and producing colorful waves and musical notes. While this does not cause any directly harmful effects, it can obscure the screen and distract the racer from driving properly. This page was last edited on February 22, 2019, at 17:07.